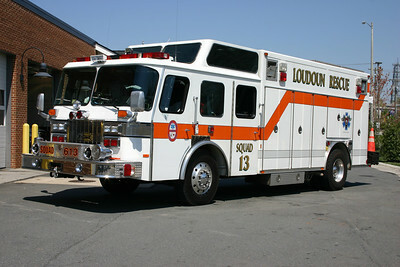 Loudoun County Volunteer Rescue Squad (Leesburg, VA) - Station 13. 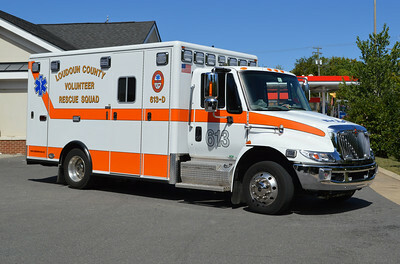 Ambulance (or Medic/Trauma, depending on staffing) 613 is this 2015 International 4300/Horton. 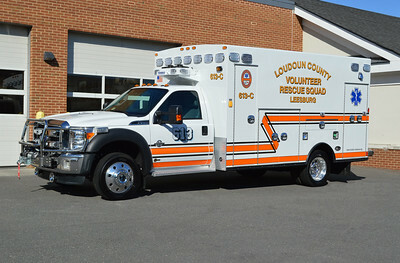 613B, a 2016 Ford F550/Braun, was delivered in October of 2016 to the Loudoun County VRS in Leesburg. 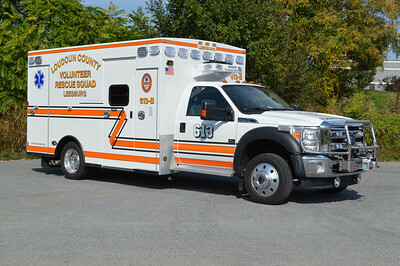 This 2016 Ford F550/Braun for 613B is the department's second Braun ambulance. Note the sliding entry/exit door to the ambulance body. A rear view of 613B, a 2016 Ford F550/Braun. 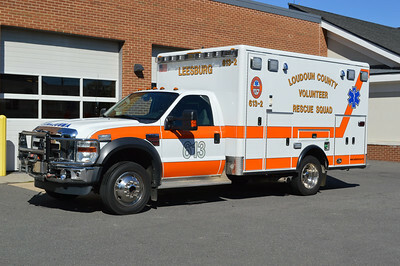 Loudoun County Volunteer Rescue Squad in Leesburg, Virginia - 613-C - a 2015 Ford F550 4x4/Braun. Note the winch mounted on the front bumper. 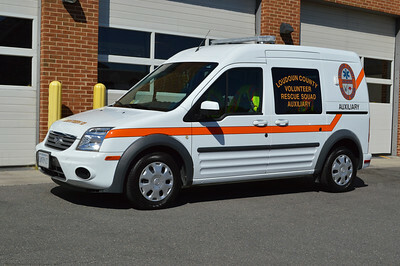 Loudoun County Volunteer Rescue Squad 613-C - shows the sliding door on the 2015 Ford F550/Braun. 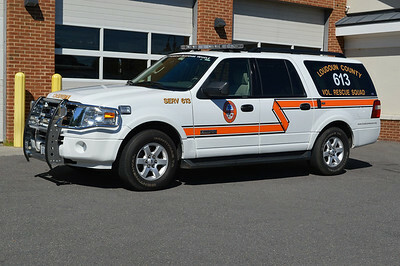 Loudoun County Volunteer Rescue Squad in Leesburg, Virginia - 613-C - a 2015 Ford F550 4x4/Braun. 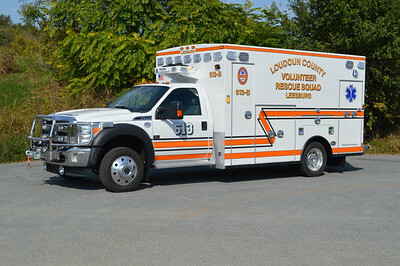 Loudoun County Volunteer Rescue Squad - 613-D - a 2013 International 4300/Horton. 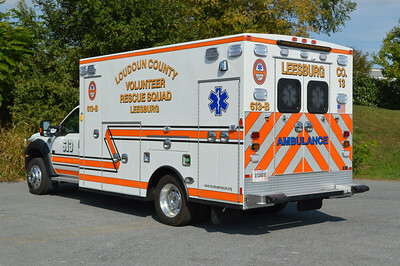 Another monster medic at Leesburg is A613E, a 2012 International 4300/Horton. 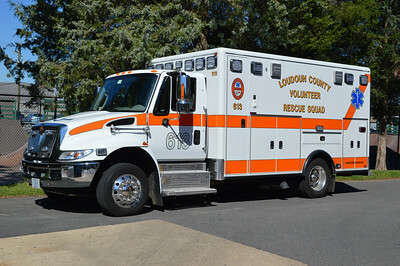 Loudoun Rescue Squad has a mix of larger International 'monster medics' and smaller Ford F ambulances. 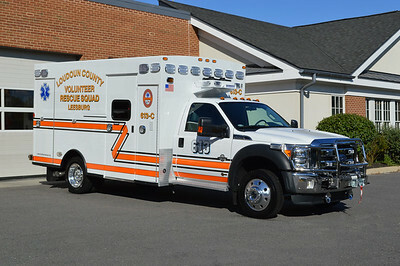 Ambulance 613B is this 2009 Ford F-450 4x4/Horton. Note the front winch. Replaced and designated as 613F in 2016. 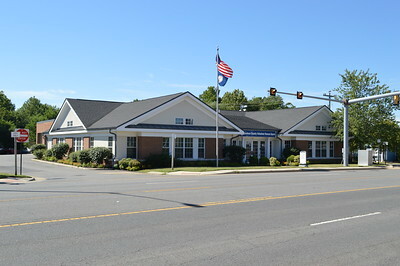 Several support units at Company 13. 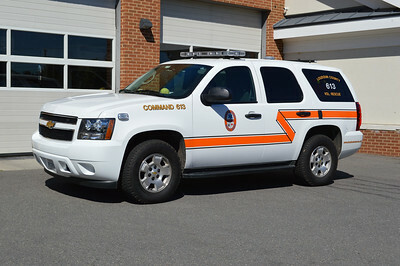 Command 613 is this 2013 Chevy Tahoe with body work done by Fast Lane. SERV 613 is this 2008 Ford Expedition/Fast Lane. 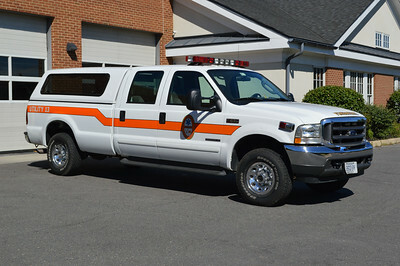 This 2003 Ford F-250 is Utility 613. Canteen 613 is this 2011 Ford Transit. 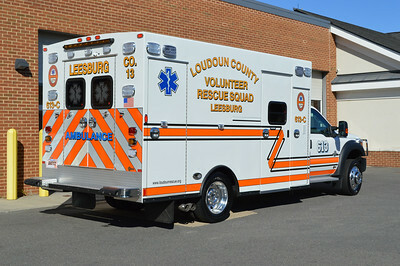 During 2014, Rescue 613 from the Loudoun County Rescue Squad (Leesburg) got "dressed up" a bit with the addition of aluminum Alcoa wheel rims and a front bumper now with black rhino lining. 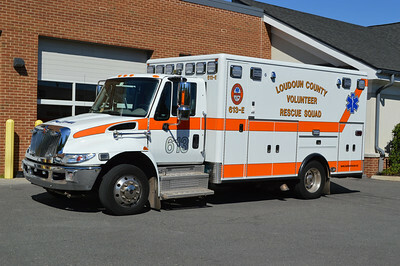 Rescue 613 was photographed at Station 20 in Leesburg. 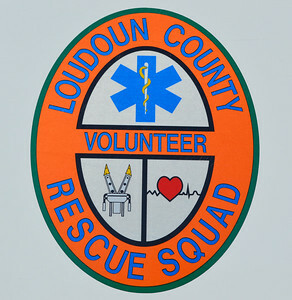 Citing staffing deficiencies, Rescue 613 was transferred to Fire Station 20 in Leesburg to be staffed 24/7 by Loudoun County Fire and Rescue personnel. The change went into effect in August of 2015. Rescue 613 is a 2009 Pierce Lance and the last "Lance" cab built by Pierce. 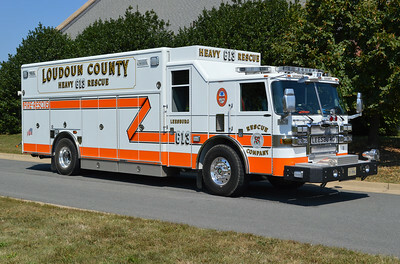 Rescue 613 was photographed at the Pierce dealership in Manassas, Virginia just after being delivered. 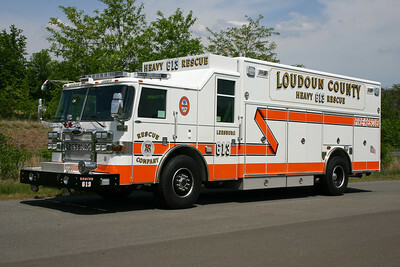 The 2009 Pierce Lance replaced Squad 13, a 1992 E-One Cyclone heavy squad. 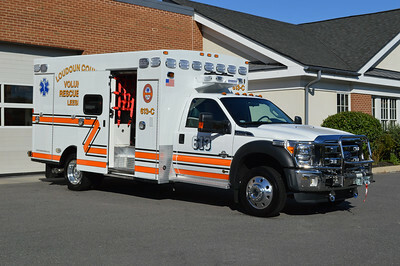 The E-One was sold to Epworth, Alabama. 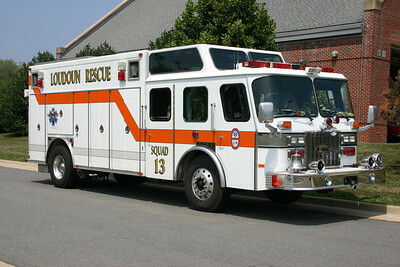 Old Squad 13 just prior to being replaced by the 2009 Pierce Lance. 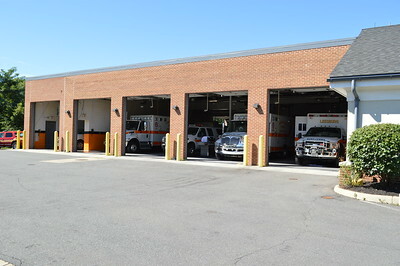 This photograph was taken at Fire Station 20 in Leesburg when the squad was at Station 20 for training. 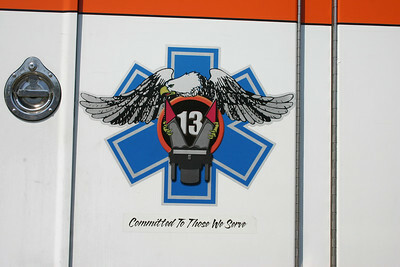 Insignia found on the former Rescue 613. 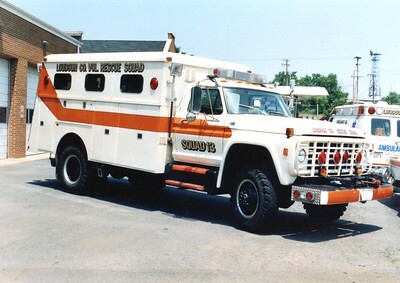 Former Squad 13, a 1977 Ford F/Reading.